For an updated version of Table 2, click here. A nonpaying tax return is one filed by an individual or couple who, thanks to legal credits and deductions, owes nothing. Most people who get a refund after filing their tax returns are not nonpayers; they have overpaid their taxes through paycheck withholding and are being refunded just a tiny portion of that payment. But during 2008, more than a third of all tax returns resulted in complete nonpayment; that is, people got back every dollar that was withheld from their paychecks during the year. Many got quite a bit more, turning Tax Day into a payday. Nonpaying status used to be a sure sign of poverty or near-poverty, but Congress and the President have changed the tax laws to pull much of the middle class into the growing pool of nonpayers. The income level at which a typical family of four will owe no income taxes has risen rapidly, now topping $51,000. As a result, recently released IRS data for the 2008 tax year show that a record 51.6 million filers had no income tax obligation. That means more than 36 percent of all Americans who filed a tax return for 2008 were nonpayers, raising serious doubts about the ability of the income tax system to continue funding the federal government’s ballooning expenditures. Since it was enacted in 1913, the income tax code has contained provisions that exempt low-income workers or greatly reduce their income tax burden. These provisions include the standard deduction, personal exemption, dependent exemption, and the earned income tax credit (EITC). Between 1950 and 1990, the percentage of tax filers whose entire tax liability was wiped out by these provisions averaged 21 percent. Since the early 1990s, however, lawmakers have increasingly used the tax code instead of government spending programs to funnel money to groups of people they want to reward. Credits have been enacted to subsidize families with children, college students, and purchasers of hybrid cars, just to name a few of the most well known. In terms of tax revenue, the most significant of these socially targeted credits was the $500 per-child tax credit enacted in 1997. The 2001 and 2003 tax bills doubled the value of the credit to $1,000 and added a refundable component. Most tax credits can only reduce a taxpayer’s amount due to zero, but the EITC and the child tax credit are also refundable, meaning that taxpayers are eligible to receive a check even if they have paid no income tax during the year. Those tax returns have become, in effect, a claim form for a subsidy delivered through the tax system in much the same way that a traditional government program sends out a welfare check or a farm support check. In 2008, 25 million tax filers received $51.6 billion in EITC benefits. Of this amount, $50.5 billion was refundable in excess of their income tax liability. Also in 2008, some 25.3 million filers received $30.7 billion in child tax credit benefits, with more than 18 million of these filers getting $20.5 billion in refundable checks. Many families are eligible for both the EITC and the child credit. These are not refunds of overpaid tax; they are payments to people who have already gotten back everything that was withheld from their paychecks during the year. Quite aside from the fact that these refundable credits remove millions of people from the roster of Americans who support the government by paying the income tax, these credits have other undesirable effects such as added tax complexity. 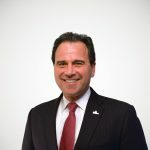 According to the annual report of the IRS’s National Taxpayer Advocate, about 62 percent of all taxpayers use tax return preparers, and the percentage climbs to about 73 percent for those claiming the EITC. Moreover, the complexity of EITC eligibility is a contributing factor to the estimated $10 billion to $12 billion in erroneous overpayments out of nearly $44 billion of total EITC claims in 2006. Figure 1 shows the fluctuation in the number and percentage of nonpayers since 1950 and how that has soared over the past decade. 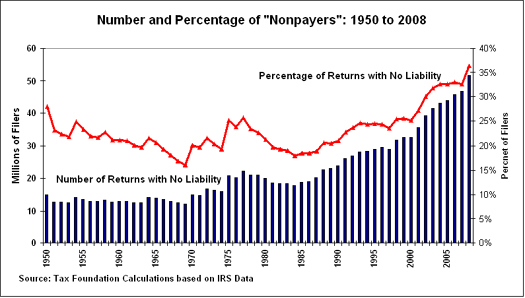 The percentage of tax returns with no liability was fairly low in the 1960s and again in the early 1980s. The recent growth in the number of nonpayers was accelerated by two major tax changes enacted during the 1990s, followed by the Bush tax cuts in 2001 and 2003. Note: These preliminary data represent estimates of income and tax items based on a sample of individual income tax returns filed between January and late September of a given processing year. These returns are then weighted to represent a full year of taxpayer reporting. In general, some of the returns processed during the remainder of the year may have somewhat different characteristics compared to these earlier ones. Therefore, these preliminary data are best utilized by comparisons made to the preliminary estimates from the prior year. When available, the estimates from the Complete Year Data should be used in place of the preliminary data. This two-decade period of growth in nonpayers was kicked off by the Omnibus Budget Reconciliation Act of 1993 which expanded the earned income tax credit. The second change was the Taxpayer Relief Act of 1997 which created a $500 per-child tax credit for families earning less than $110,000. In 1990, there were 23.8 million nonpayers, but as a result of these legislative changes, 2000 arrived with 32.5 million nonpayers. That was a percentage increase of 36 percent while the total number of tax filers in the nation grew by only 13 percent. Entering the 2000s with one in four tax filers owing nothing, the nonpayers pool was supercharged by the Bush tax cuts in 2001 and 2003—especially by the doubling of the child credit to $1,000. By 2004, when the credit expansion was fully phased in, the number of nonpayers increased by 10.5 million, a 32-percent jump in the space of four years. In tax year 2008, the major tax change that created a record number of nonpayers was the Economic Stimulus Act of 2008, which included a tax rebate of $300 per person, $600 per couple. A family of four was eligible for a rebate of $1,200. These tax rebates boosted the number of nonpayers to nearly 52 million, 19 million more than the number of nonpayers in 2000 when President Bill Clinton left office. This represents a 58.6 percent increase in the number of nonpayers in less than a decade. By contrast, the total number of tax filers grew by only 10 percent during the same period. Tax year 2009 is likely to be a repeat of 2008. President Obama’s newly created making-work-pay credit, first-time homebuyer credit, and American Opportunity tax credits have expanded the number of opportunities for people to erase their income tax obligation. As a result of these measures, the percentage of nonpayers is likely to again exceed 35 percent in tax year 2009. Table 1 shows how the various tax changes since 1993 have increased the maximum income level that a typical family of four can earn and still have no income tax liability after credits and deductions. These estimates assume that the family would take the standard deduction and the basic credits such as the child credit, but not the EITC which now phases out well below this maximum threshold. In the years leading up to the enactment of the child tax credit in 1997, the top threshold held steady below roughly $24,000 in today’s dollars. Following the enactment of the child credit, the threshold immediately jumped 30 percent to more than $31,000 in 1998, then grew to $32,790 in 1999. When the value of the child credit was increased to $600 in 2001—as the first phase of the doubling from $500 to $1,000—the nonpayer threshold jumped by more than $6,500, an increase of 20 percent. The threshold topped $47,000 when the child credit reached $1,000 after 2003. Because the value of the child credit is fixed and not indexed to inflation, the threshold actually began to decline in real terms until 2008 when the stimulus plan was enacted. The major elements of the Economic Stimulus Act of 2008 boosted the maximum income for nonpayers to more than $56,700. In the absence of the rebates, the threshold would have been roughly $44,500. President Obama’s temporary making-work-pay credit has a maximum value of $800 per couple and will keep the nonpayer threshold over $50,000 for tax years 2009 and 2010 if there are no further changes in the tax code in 2010. Source: Tax Foundation calculations based on IRS data. Over the past two decades, Washington lawmakers have increasingly turned to the tax code to deliver social benefits, incentivize behaviors, and funnel money to targeted groups, which they always refer to as “helping the middle class.” These measures have not only added complexity to an already Byzantine tax system, they have also eliminated the income tax obligation for millions of tax filers and their families. As a result, a record 51.6 million tax filers—36 percent of all filers—had little or no connection with the basic costs of government in 2008. Tax years 2009 and 2010 are likely to produce a number of nonpayers equal to or greater than in 2008 because of Obama’s new tax credits targeted at lower- and middle-income taxpayers. As the number of refundable tax credits continues to grow, more and more tax filers are seeing the IRS as a source of income, not something to which taxes are paid. The consequences of these trends deserve a broader national discussion than either party in Washington seems willing to engage in. Table 1. Individual Income Tax Returns, Tax Year 2008 Preliminary Data: Selected Income and Tax Items, by Size of Adjusted Gross Income. Internal Revenue Service.